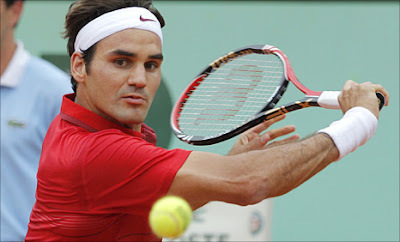 Roger Federer will play Rafael Nadal in a fourth French Open final after ending Novak Djokovic's winning run in 2011 with an extraordinary 7-6 (7/5), 6-3, 3-6, 7-6 (7/5) victory at Roland Garros. The world No2 was looking to equal John McEnroe's record of 42 straight wins to start a season but it was not to be, and on Sunday Federer will attempt to beat Nadal for the first time on the clay in Paris. 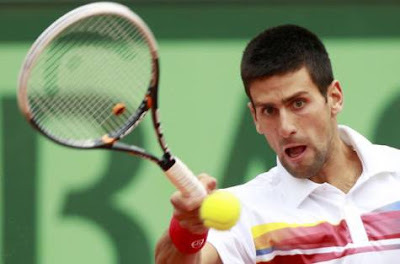 Djokovic was below his best in the opening two sets, perhaps affected by his five-day break following the withdrawal of quarter-final opponent Fabio Fognini, but he got better and better and the fourth set was sporting drama of the highest quality. A combination of the surface and the wind have made service breaks more common than usual in the men's tournament this year, and it was the same at the start of this match as a break for Federer in the opening game was followed up by one for Djokovic. The Serb then saved four more break points to secure the first service hold before moving 4-2 in front. 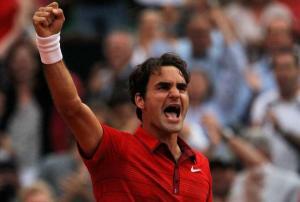 Back came Federer, though, and the 2009 champion showed what he is made of by saving two set points at 4-5. The Swiss was clearly the crowd favourite and he was rising to the challenge, maintaining the form that had seen him reach the last four without losing a set. 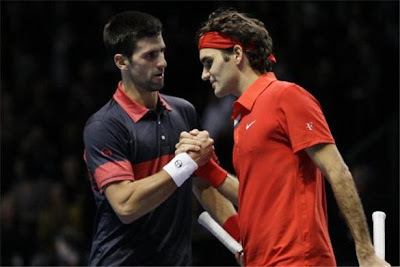 The tie-break was as tense as the occasion suggested it should be and, although Djokovic retrieved an early mini-break, he dumped a forehand into the net on Federer's first set point to a mighty roar from the enthralled crowd. The Swiss saved a break point at the start of the second and, when he broke Djokovic to move 3-1 in front, the prospect of another Federer-Nadal final was a very real one. Djokovic has been supreme this year but at some point it was inevitable he would not be able to keep up that standard, and he had to battle very hard to stop Federer moving 5-1 ahead. The 24-year-old was under siege but he continued to dig deep, saving five set points in his next service game, and there was a brief opening when Federer then conceded a break point of his own. But that disappeared in the blink of an ace and on his sixth chance the 16-time grand slam champion moved two sets ahead. 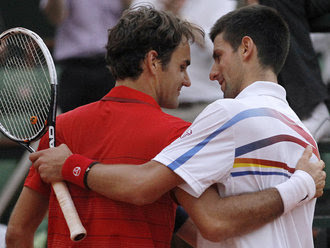 Federer had played 174 previous matches at grand slams without ever losing from two sets up but he found himself a break down at the start of the third as Djokovic fought for his French Open life. And that was enough for the Serb to take the set as the clock ticked past 8.30pm. 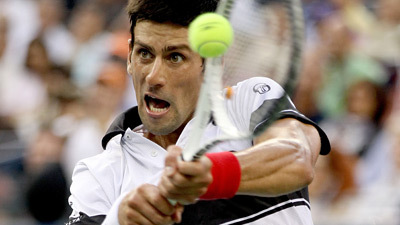 Djokovic could take heart from last year's US Open semi-final, where he had trailed Federer by two sets to one and saved match points, while he had also won their last three meetings. The 24-year-old had cut his unforced errors right down and, when Federer's first serve went missing in the ninth game of the fourth set, Djokovic had his chance. The Serb just missed with a backhand on his first break point but on his second Federer framed a forehand to leave Djokovic serving to level the match. The 29-year-old was not finished, though, and the crowd were on their feet when he creamed a backhand down the line to bring the set back on serve at 5-5. Federer then saved two more break points with big serves to leave Djokovic serving to stay in the match. When 30-0 became 30-30, the crowd sensed this was the moment, but the second seed showed nerves of steel to hang on and force a tie-break. The crucial error came from Djokovic, though, allowing Federer a mini-break for 4-3, which he consolidated with two big serves. A net cord saved one match point and an ace the second, but an 18th ace gave the world number three victory with darkness falling.